There are several negatives of blogging. The potential bad things about writing a blog can affect anybody, particularly those thinking of going professional. There are also many good things about blogging, but it isn’t all good – with everything going perfectly well and you being able to sit in front of your keyboard and make money whenever you needed it. There are many negatives involved in serious blogging, and professional blogging offers even more potential issues. So what are these problems? Surely blogging is a great life, where you make money doing nothing but click a few keys each day and write an occasional post. Maybe stick up some products that your readers will queue up to purchase, and if you want the day off – well why not? You have already written two posts this week! Nope – things are not like that! Blogging is not as easy as most believe it to be. If you blog for fun, then you will have fewer issues. However, both amateurs and professionals will experience many of those negatives of blogging that we shall discuss here. This is for both: hobby bloggers and pros. These ‘bad’ things about blogging can also be taken as ‘good’ things if you enjoy the work. However, they are aspects of writing blogs that many people find to be chores when in fact they are the essence of blogging and why many people become bloggers. Blogging takes a lot more time than you think it does. Each post takes a lot of research to make sure your information is accurate and that you are not simply copying what others have already written about the same topic. It’s one thing starting up a blog to write your thoughts, but quite another to get these thoughts together in a form that can be published for others to read. If you want to make it as a professional blogger, you must be able to find unique content. It need not be a unique topic, but should at least be a different take on an old subject. Provide an alternative viewpoint to what others are writing online, and gather together your own readers rather than try to steal those from other blogs. What are you writing about? If you want a following then you must tackle a consistent theme, whether that is SEO and blogging, cat training or how to make the best mud cakes in the world! Once you have decided on your theme you are stuck with it. You can’t run a blog on cat training for a few weeks and then change to goldfish memory training. Or perhaps you could if your blog was titled ‘Impossible Pet Training Techniques’ – you will have defined your topic so you can expand on it! What we are saying is that, when starting up a blog, try not to be too narrow at first. Choose a broad topic such as ‘Exotic Pets’ rather than ‘Norwegian Blue Parrots.” The first will offer a lot more scope for blog posts than the latter. To begin with, it is not so much about finding topics to write about, but finding topics that offer sufficient scope for multiple posts and the potential to expand your blog into other primary subjects. You can always specialize later if you wish. It’s very easy to be a parrot yourself: writing whatever you have read others writing. It’s not so easy to be original, but most successful bloggers are. One of the bad things about blogging is the time you must put into researching your potential topics. 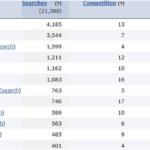 Google Trends, Repinly and Buzzfeed are excellent tools if you want to find what people are talking and writing about. Blogging is no magic bullet that draws cash like iron filings to a magnet. You can start-up and work for weeks and make nothing, but you are attracting a readership. Professional blogging does not offer a guaranteed income – so don’t pack in the day job until you are making enough to feed yourself, look after your family and pay all the bills. This can take time. Too many people believe the internet to be a cash cow, but it isn’t. It takes time and experience to make a living online and most never manage it. That is one of the main misconceptions about blogging: it can give you false hopes of making lots of money quickly. There is nothing to stop you making money with your blog, but it takes time, a lot of learning and a lot of hard work. Perseverance pays in the blogging world! You are not guaranteed readers. For people to read your blog they must first find it. That is a skill in itself, but there is lot you can do to get your blog noticed. Learn the basics of search engine optimization (SEO) but don’t lose sleep over it- a good blog will eventually be noticed. Try to be unique and you will have a better chance of success. Use social media for free advertising. Setting up a Facebook business page, tweeting posts and using Instagram, Pinterest and even publishing YouTube videos will all help get your blog out there in the web where people can notice it. Whatever you write about, some people will misunderstand your meaning and others will disagree with you. It is important to keep your head and not react negatively to criticism – deserved or not. Respond by trying first to understand the other person’s viewpoint, whether you agree with or not. At least understand what they are complaining about before you respond, but make sure you respond. Readers like to be noticed. You can do this by explaining your point more clearly – many bloggers are ambiguous in some of the points they are making. If it is a disagreement in principle, then don’t get involved in a public argument through Comments. Agree to differ, or discuss the matter privately. 6. Your Writing Lives On! No, this is not always a good thing! Often the subject of a discussion between Google and various authorities, the lifetime of your posts might be an issue later in life. People blog their views about topics when they are young, that they grow out of as they mature. However, it is possible for certain authorities to trawl up your past statements and beliefs from years-old blog posts. Keep in mind that your writing lives on in the web, and that it can be resurrected at a later date to embarrass you or even cost you your job! So be careful when you blog, and don’t write anything you wouldn’t want your mother, your kids or your boss to read! Any blogger wanting their blog published and read beyond the confines of their own family or group of friends must keep up with technology and search engine developments. Like it or not, your online promotions are subject to the policies of search engines such as Google. It is important to keep in touch with Google algorithm updates such as Penguin to ensure that your blog is visible to as many potential readers as possible. You should also make yourself familiar with the new social media: there is more now than just social bookmarking, Facebook, YouTube and Twitter. Find what people are using and use it yourself. This is listed as one of the bad things about blogging because it is one more task you have to carry out on a regular basis. Sure, Pinterest and Instagram might be interesting, but for you it is just one more social site that you must use to keep ahead of your blogging competitors. The Really BAD Things about Blogging! If a comment does not refer directly to the content of your post then it is almost certainly spam. These comments can come in their hundreds, and Google will possibly punish your ranking unless you remove them. Make sure you set your comments to require approval before being published, or your readers will take a dim view of you allowing all this spam and likely go elsewhere. Even if you do delete them, it can give you a great deal of unnecessary work. Make sure you have a spam filter activated – but even then you should check your comments every day. You might be lucky, but it can take up to 10-15 minutes each day to delete all the blog spam you are sure to get. Read this article to know more about blog spam. When you allow people to discuss the content of your blog, then be prepared for some vicious comments. The occurrence of such disagreements will depend upon your topic – a blog about current affairs or alternative medicine will whip up more passion than Disney cartoons. Some of these can be very heated and personal and you will have a fair bit of censoring to carry out. You may not want some of the language published, but this only creates more problems when people complain about their comments being deleted. Editing might work, but you will have to inform those involved that bad language or personal threats will be deleted. Blog trolls are the same as any other trolls, and are the worst of the negatives of blogging. If you had to name one of the really bad things about writing a blog, it would be these blog trolls that deliberately abuse people and try to hurt them through their comments. They are cruel and malicious, and get even worse when you respond to them – so don’t bother. Deleting all of their comments is the best way to handle them. They will continue writing their abusive filth, and will only stop when they see their comments are not being published. You could also bar their IP address – you may find it attached to the comments, or by using applications such as AWStats and Webalizer. However, genuine trolls change IPs frequently and often work through proxies. These are the 10 on my list – yours might be different, so feel free to comment. I shall finish with alternative views of four of the so-called ‘benefits’ of blogging. There is a good and bad side to almost everything, and professional blogging is no different. Many of these observations will apply to any form of home business, not just blogging. Positives: Fabulous – no more traveling to work! Working from home sounds great since you have no rising early on cold, wet mornings – no traffic to get through and no worries about getting to the office in time. Just wake up and there you are! You don’t even have to get dressed if you can’t be bothered to. Your family is around you and no need to spend money on lunch or car expenses. Negatives: Your family is around you! If you have children, they will want to know what mom or dad is doing, and you can be sure of constant interruptions – at least until school age. You are handy for chores, and will likely need a second telephone line! All of this family communication is great, but it means you lose some motivation and it is very easy to miss schedules. Working from home might seem all roses – but there are a few thorns involved. 2. You Have No Boss! Positives: Great! No boss to answer to! No more reports or meetings! Blogging from home means that you are your own boss with nobody monitoring you or urging you to get more work done. You can carry out your work the way you feel it should be done, and not how somebody else, or even a committee, thinks it should be done. Negatives: You need to stay motivated, and sometimes this can be difficult. It is easy to take time off when you feel like it, and many who start working for themselves find this to be a genuine issue – at least for the first few months. You are responsible for your own actions and face the consequences yourself. Positives: You have no limit to your income, and get paid more the more work you do. Working as a paid employee, you get the same amount each month irrespective of how hard you work – other than some exceptional circumstances when bonuses might be paid. 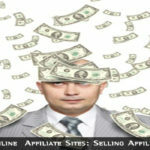 If you want a raise then all you need do is work a bit harder or longer – write another post or sell another affiliate product. You control your own income! Negatives: You have no minimum limit to your income, so if your blog doesn’t pay, you don’t get paid. There are no bonuses for working harder – more income comes only if your readers want to buy. You have competition you must identify yourself, with no company marketing team to advertise for you and keep you ahead. You do all of it yourself. You can work harder and get nothing back for it. Positives: You have no set topics that you must research. You can write about anything you want to write, which enables you to focus on what you like most and what you know most about. It’s more fun and more aesthetically rewarding. Negatives: You have to be sure that everything you write is factually correct. You may have many people questioning your views, and you must never lose sight of the fact that you depend on your readers. In professional blogging, you will find that you can’t just write what you want to write about. A professional blogger must write about what people want to know or to read. That involves research that you must carry out yourself. 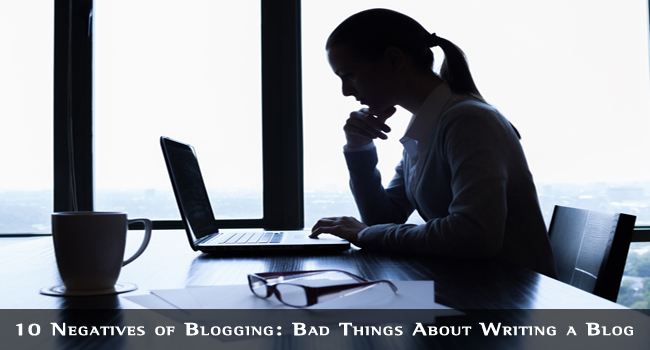 Be aware of all of these bad things about writing a blog but don’t get concerned about them. By being aware of these negatives of blogging you will be more able to avoid them. Blogging is great fun, whether you are a personal, hobby or professional blogger. If you understand that there are some negative aspects of this great activity then you will be ready for them if they appear. That’s half the battle to blogging success. The other half is hard work!